If you live in North America, you’ll surely be aware that Baldwin is a household name. In fact, my first job involving pianos was in the local Baldwin dealership. They have been around since 1862 and were at one point the largest piano manufacturer in North America. At the NAMM trade show this year, I caught up with Tom Dorn (pictured on the right) as I was curious how Baldwin has changed over the last few years knowing that they had been sold to Gibson Guitar Corporation in 2001 and in 2008, moved manufacturing to China. But I was equally curious to know what elements have stayed the same. As I approached the Baldwin booth, I couldn’t believe how the cabinets were identical looking on some of the models from decades ago. Baldwin, in my opinion has always captured the essence of American décor. Glen Barkman: Tom, they look identical to pianos I used to sell. Are they using similar cabinet designs? 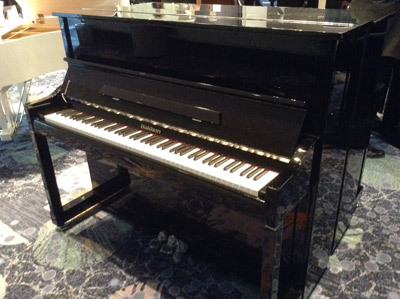 Tom Dorn: These furniture models (B342 & B442) are updated versions of the old Acrosonic pianos and have identical cabinets. The Hamilton studio piano (B243) is the latest version of our institutional vertical, and the model B252 is the updated version of the Concert Vertical (Model 6000). The new Baldwin Professional Series Grands have cabinets that were modeled after the most recent version of Baldwin Artist Grands (M1, R1, L1) that received that cosmetic makeover in the year 2000. GB: What are some of the features that are unique to Baldwin that are implemented into current designs? TD: The new BP (Baldwin Professional) Series Grands are done with the same “level” of materials that we traditionally used in Baldwin Artist Grands. The grands feature all-maple inner and outer rims, wet sand cast plates as well as solid Sitka spruce soundboards, Abel hammers, duplex scaling, and real ebony sharp keys. Baldwin verticals have a strong 5 post backframe, wet-sand cast plates, complete with Baldwin full blow action, and are now using Accu-just hitchpins ~ a way to accurately apply downbearing to the bridge from the string hitch. All Baldwin verticals are equipped with a functional middle pedal that is a bass sustain. GB: What are some new upgrades that the old Baldwins didn’t have? TD: Baldwin Verticals now have added the felt-strip mute rail or quiet play feature on a small lever on the lower part of the cabinet. This allows us to offer that capability without sacrificing the middle pedal. The BP178, BP190, and the coming BP211 Grand models all feature the new slow close Magic Lid. This is a hydraulic system that allows you to lift the heavy grand lid with 2 fingers and makes opening and closing the lid on these pianos much easier and safer. GB: Are there some features like hammers or strings that are the same brand 20 years ago that are still used on today’s pianos? TD: We still use all maple parts in our actions, and the last change in the vertical action design came in 2002 when we altered the balance rail for faster repetition. We may have different suppliers for some parts, but they are all built to Baldwin specifications. GB: What prompted the change to build pianos in China? 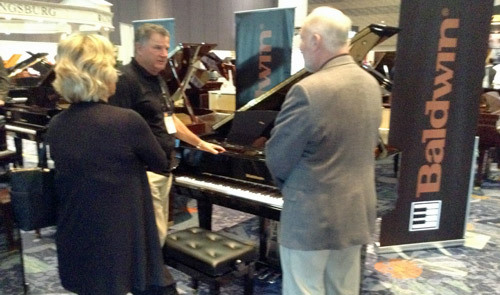 TD: The global piano market has changed dramatically. The Chinese domestic piano market is approximately 350,000 pianos annually – which accounts for 80% of the world’s new piano market. The USA only sells about 35,000 pianos per year. China simply is where the market is. When I started in the piano business back (way back) in the 1970s, there were many US manufacturers because the US market was selling upwards of 200,000 pianos annually. It made sense to make pianos here because it was the largest market. GB: What are some of the new models released now? I remember the Artist series grands were M, R, L, SF and SD. That line has been expanded slightly to meet the needs of today’s consumers. What are the sizes of grands now? And uprights? What are the latest models? TD: There was a 5’2” Artist Grand, the Model M (probably my personal favorite, one of the best small grands ever built). The new grand models are the Baldwin Professional Series (BP) and have a number designation that indicates the size in centimeters. They are BP148 (4’10”), BP152 (5’), BP165 (5’5”), BP178 (5’10”), BP190 (6’3”), and coming soon the BP211 (6’11”). I would suggest that someone who liked the M should try the BP165, the R the BP178, the L the BP190, and the SF10 the BP211. For verticals we still make 2 Acrosonic 43” consoles (B442, B342). Everything else follows today’s demand for taller uprights. The new BP1 and the B243 are 47”, the BP3 is 48”, and the BP5 is 49”. The B252 is 52” as it is exactly like the model 6000 Concert Vertical. GB: What makes the new Baldwins sound “warm”? 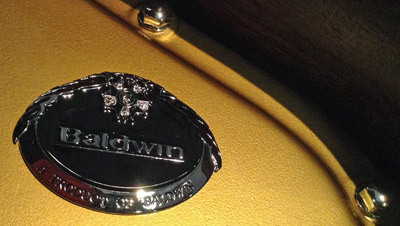 TD: The ‘warm’ Baldwin tone is a result of using similar materials to the ones that we always have (such as Abel hammers), and by having a product manager at the factory who has worked with Baldwin pianos for many years. Barnabas Fekete inspects each Baldwin Grand as it comes off the line and makes sure it is voiced to sound like a Baldwin. GB: What’s the advantage of having a mega corporation like Gibson at the helm? TD: Gibson is obviously no stranger to the music industry. Established in 1902, they have grown to become one of the largest music names globally. Purchasing Baldwin back in 2001 has given Baldwin presence and the stability of a major American corporation. One of the biggest advantages is the Gibson Entertainment Relations Division. Gibson has dozens of offices around the world that are working to promote their brand names. 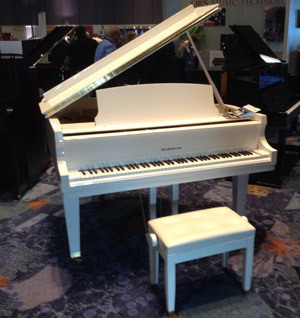 In the case of pianos this can be seen in terms of highly visible placements on TV Shows such as “Glee” or “Arrested Development” and movies such as “Behind the Candelabra” on HBO not long ago. Gibson also maintains the Trumann factory as a parts facility should technicians require parts for older Baldwin USA pianos.